Gil Cisneros, a Democrat running in California's toss-up 39th Congressional District, has investments in more than 30 companies in the oil and gas sectors through his personal foundation, including one company that paid the U.S. government millions in settlements after bribing officials at an Uzbek state-controlled oil firm, according to a review of his foundation's tax forms. In spite of this, Cisneros has been campaigning against the industry as part of his plan to defend the environment and combat climate change. Cisneros additionally reported personal holdings ranging anywhere between $500,000 to $1.4 million in such investments on his financial disclosure forms. Cisneros, a Navy veteran and multimillionaire philanthropist who garnered his fortune after winning the lottery, has heavily self-funded his campaign throughout the Democratic primary and is yet again fueling his efforts against Republican Young Kim, a former state assemblywoman and previous staffer for Rep. Ed Royce (R). Currently representing the district, Royce is vacating the seat he won by 15 points during the 2016 elections even as Hillary Clinton took the district. Democrats are looking to California's 39th district as a pivotal race in reclaiming the House of Representatives. 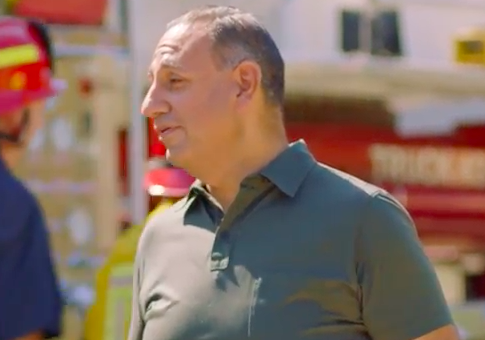 The plan laid out by Cisneros to defend the environment and combat climate change—a cornerstone of his campaign as California faces wildfires across the state—involves taking on those who are "beholden to corporate oil money" and rejecting the industry as a whole, which he says puts profits above health and access to clean air and water. "Gil views our nation's reliance on fossil fuels as the pinpoint of climate change. The problem is that our current Congressional leaders are beholden to corporate oil money instead of the people they represent," the campaign's website states. "Gil has taken a pledge not to accept any oil money and will stand up to big oil and energy companies who put profits above our nation's health and access to clean air and water. He opposes President Trump's plan to open up California's coast for drilling—including Orange County." "Oil consumption and its devastating environmental impact can be reduced through the production of cleaner fuels, expanding the use and affordability of electric vehicles, and by improving the fuel efficiency of cars, boilers, ships, and trucks," it later continues. "In Congress, Gil will vigorously oppose Trump administration efforts to roll back fuel efficiency standards that help reduce reliance on foreign oil and lower carbon emissions." Cisneros, through the Gilbert and Jacki Cisneros Foundation, has interests in the very industry he now vows to combat. The foundation is his personal nonprofit, which invests in dozens of corporate stocks in oil and gas drilling companies as well as companies who manufacture products that are used in the sector. Cisneros launched the Gilbert and Jacki Cisneros Foundation with the intent of cultivating a community that supports Hispanic student education. Jacki, his wife, acts at the foundation's president while Gil serves as its veterans and education advocate. The foundation reported roughly $15 million in assets on its most recently available Form 990 from 2016. The Gilbert and Jacki Cisneros Foundation's Investments Corporate Stock Schedule shows the investments that the foundation has made, including those with the oil-related companies. Cisneros, who lambasts foreign oil as part of his environmental plan, has interests in a number of oil companies headquartered overseas. One such company, Total S.A., is a French multinational corporation that is one of the four largest oil, natural gas, and specialty chemical companies in the world alongside BP, ExxonMobil, Shell, and ChevronTexaco. Cisneros also has stakes in TE Connectivity, a Switzerland-based technology company that manufactures a variety of products, including tools for offshore oil and gas drilling; Sasol Ltd., a South Africa-based energy and chemical company that deals with mining and exploration of oil and gas; and Kosmos Energy, an oil company based in Dallas but incorporated in Bermuda with offices in Ghana, Mauritania, Senegal, and Suriname. Tenaris, a global manufacturer of steel pipes that transport oil and natural gas, and another company Cisneros invests in through his foundation, agreed in 2011 to pay millions in settlements to the U.S. government for violating the Foreign Corrupt Practices Act. Tenaris made bribery payments to officials of an Uzbek state-controlled oil firm and was later awarded a number of contracts from the Uzbekistan government, which netted the company nearly $5 million in profits. Tenaris was the first company to enter into a Deferred Prosecution Agreement, which is used to facilitate corporation during Securities and Exchange Commission investigations, and ultimately paid $8.9 million in total fines. All told, Cisneros reported interests in the following companies directly in the oil and gas sector or those that produce equipment used by the industry: Aegion Corporation, Alfa Laval, Atlas Copco, Concho Resources, ConocoPhillips, Core Laboratories, Diamondback Energy Inc., Dril Quip Inc., Encana Corporation, Energen, EOG Resources, EQT, Gulfport Energy, Honeywell International, LyondellBasel, Marathon Oil Corp, Marathon Petroleum Corp., Newfield Exploration, Parsley Energy Inc., QEP Resources, Rice Energy (acquired by QEP Resources), Royal Dutch Shell (Shell), RSP Permian (acquired by Concho Resources), Sasol, Schlumberger, SSE PLC, Superior Energy SV, TE Connectivity, Tenaris, Tesoro (now Andeaver), Tetra Tech, Total SA, and Wildhorse Resource Development. The Free Beacon attempted to obtain the foundation's 2017 tax forms, which were due on May 15, but were told the group was granted a filing extension until November 15 and that tax attorneys are still working on its financial statements. Cisneros also reports 64 separate assets ranging in value from $560,006 to $1,430,000, with dividends and capital gains ranging from $37,614 to $123,300, on his personal financial disclosure forms with the oil and gas industry, according to an earlier analysis from Climate Hawks Vote, a California-based liberal super PAC that backed Sam Jammal during the Democratic primary in the 39th district. "Our analysis shows that Cisneros is simply yet another multimillionaire whose investments make him conflicted, at best," R.L. Miller, political director of Climate Hawks, said in April when the analysis was released. "His history of investments in the oil industry is not in line with California Democratic values. Because Cisneros is largely self-funding his campaign, we regard dividends from Exxon and Halliburton to be direct contributions from Exxon and Halliburton to his campaign." The group called on Cisneros to disclose any oil interests from which he divested. Despite Cisneros's personal interests with the oil sector, the Democratic candidate touted his endorsement from the Sierra Club, which he also used to attack oil companies. "I'm proud to have the Sierra Club with me as we work to protect our climate for future generations," Cisneros said. "The Trump administration is waging an unprecedented attack on our environment. By undermining environmental laws, including California's clean car regulations, the President is accelerating the effects of climate change and putting the well-being of our communities at risk. While the President and my opponent side with big oil companies that harm our air, water, and coastlines, I pledge to combat climate change and push for investments in a green economy so we can create a clean planet for our children and grandchildren." The Cisneros campaign did not respond to requests for comments on the investments through his foundation or those reported on his personal financial disclosure form. This entry was posted in Politics and tagged 2018 Election, California, Oil. Bookmark the permalink.